The word "sustainability" has been connected to everything from a certain kind of economic development to corporate promises about improved supply sourcing. But despite the apparent ubiquity of the term, the concept of sustainability has come to mean a number of specific things. 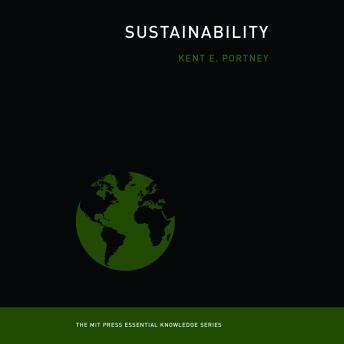 In this accessible guide to the meanings of sustainability, Kent Portney describes the evolution of the idea and examines its application in a variety of contemporary contexts -- from economic growth and consumption to government policy and urban planning. Portney takes as his starting point the 1987 definition by the World Commission on Environment and Development of sustainability as economic development activity that "meets the needs of the present without compromising the ability of future generations to meet their own needs." At its heart, Portney explains, sustainability focuses on the use and depletion of natural resources. It is not the same as environmental protection or natural resource conservation; it is more about finding some sort of steady state so that the earth can support both human population and economic growth. Portney looks at political opposition to the promotion of sustainability, which usually questions the need for sustainability or calls its costs unacceptable; collective and individual consumption of material goods and resources and to what extent they must be curtailed to achieve sustainability; the role of the private sector, and the co-opting of sustainability by corporations; government policy on sustainability at the international, national, and subnational levels; and how cities could become models for sustainability action.